Know what I was doing a week ago today? I was hosting my Bead for Life party! I wrote about how I found out about Bead for Life, and how I made a set of prayer beads from some of their loose beads in this post. I cannot tell you how easy and fun this party was. All I did was go to the Bead for Life website and sign up to host a party. I picked the date (June 21) and guesstimated on how many guests I might expect (20) and Bead for life sent me a BIG BOX. Inside were bags and bags of some colorful, creative, meaningful jewelry. I sent out an eVite to all my pals and went to Trader Joes and bought a buncha goodies. Then I cleaned my house. CLEANNNNNEEEED MY HOUUUSSSE. This was the worst part of throwing the Bead for Life party, but there ya go. It had to be done. Otherwise, we would not have found the beads under all the dog hair and dust bunnies. Okay, the day of, I laid the beads and the jewelry out on placemats on th dining room table, threw the CD of songs sung by the women beaders Bead for Life sent me and waited for the doorbell to ring. About 12 of my friends came by and everyone oohed and ahhhed over the beads. It took most people quite a while to decide what they wanted because there was so much to choose from and each item was different! But everyone left with something – and a full tummy. I cannot encourage you too strongly to host one of these parties. It is such a good cause, benefiting Ugandan women, some of whom have been war crimes victims (read: raped) and some who have HIV. 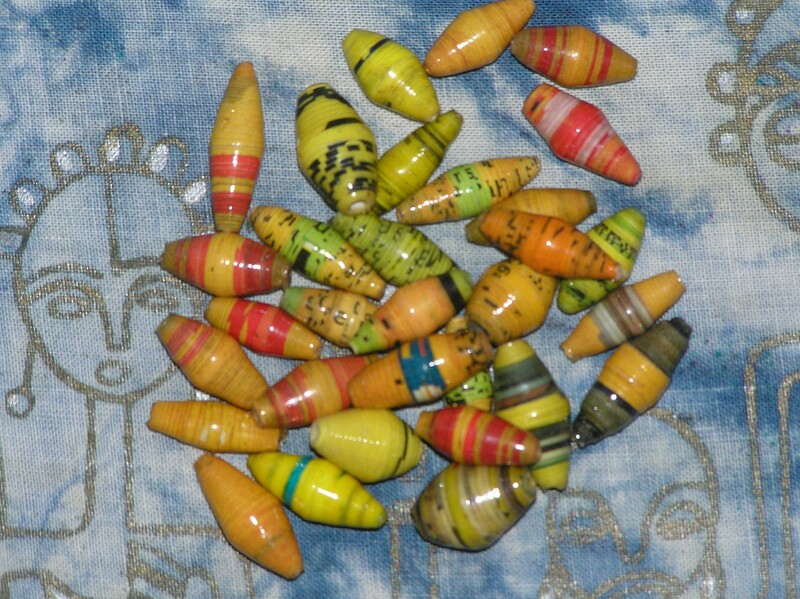 They make these beautiful beads from long strips of colorful paper, rolling and gluing them into beads. 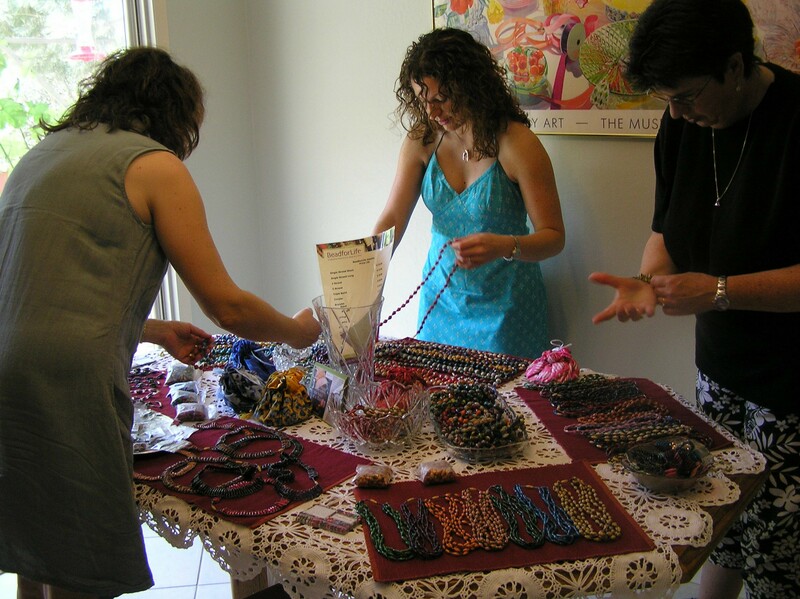 Then they shellac them and string them into bracelets, necklaces and earrings. With the money they earn they pay rent, send their kids to school and buy food. And the jewelry is lovely! I bought a 5-strand necklace of pink beads and four bangle bracelets, each a different but coordinating color so I can wear one or all at the same time. Then, when the party was over, I packed up the beads and sent ’em with my husband to work. Next they go home with my girlfriend Daniela so her mom can have a look. So far, we’ve made about $700 for Bead for Life. I am thrilled! And when I am all done, I just put the beads back in the box they sent them in and slap the mailing label they sent me on top. DONE! Now it’s your turn! BEAD FOR LIFE! The Sea Ranch, Monday morning . . . . This morning, sitting in the window overlooking the ocean, I got out the packet of paper beads I ordered last month from Beads for Life. 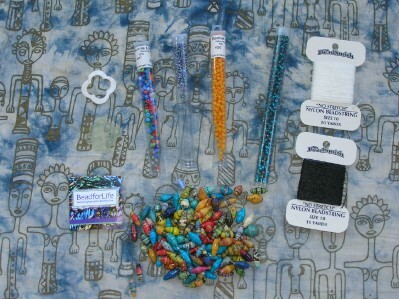 I am going to hold a Beads for Life party in June and I couldn’t wait till then to see what they were like, so I ordered a packet of loose beads. 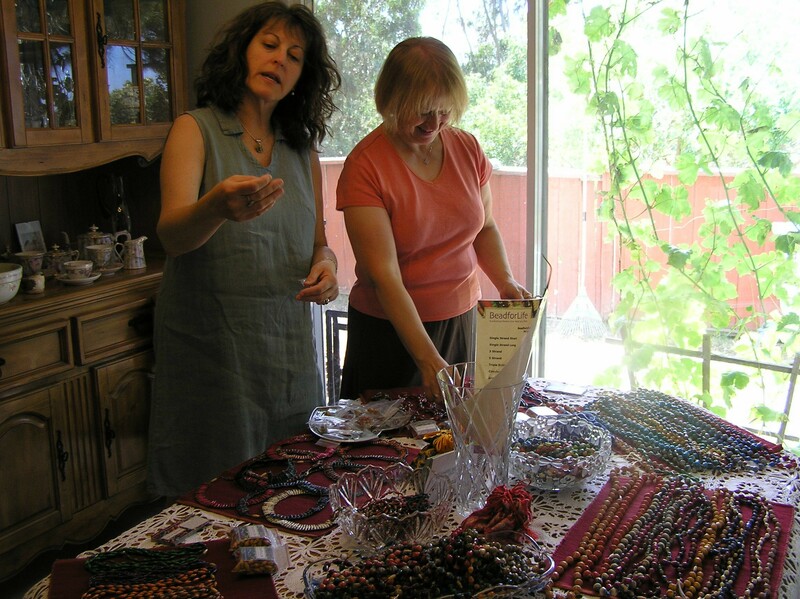 I brought them, and some other supplies, to The Sea Ranch with me so I could make a set of prayer beads with them. First, I separated the more than 100 beads into colors – pinks, reds, yellows, oranges, green, blues and multi-colored beads. I decided I’d like a set of prayer beads where each section – weeks for an Anglican version, decades for a Catholic version – would be a different color. For the uncounted connector beads, I chose a size 8 seed bead that is yellow with small red stripes. For the terminal charm, I chose a kind of cross that I purchased at Baubles and Beads I don’t know how long ago. It is a cross with four equal arms and has cut outs inside it. It’s kind of a Jerusalem cross. It is made of jade, I think, or some other pale green stone. I really must start keeping better records of what I buy because I forget after I get things home. I thought it would be nice because it is stone would give the paper prayer beads some heft. Also, its color reminds me of the color of waves when the light shines behind them – a kind of pale bottle green. I decided to make a basic Anglican rosary (page 122 in Bead One, Pray Too), but there were enough beads in the packet that I could have made a basic Catholic rosary (page 125), too. 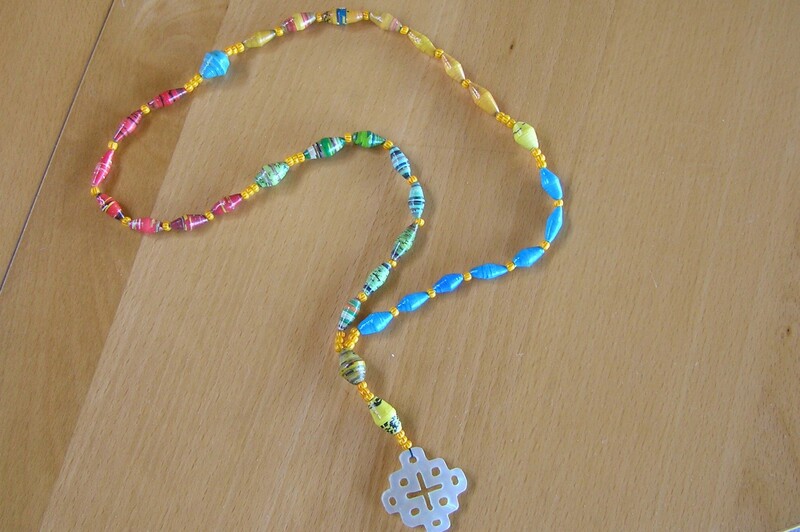 But as the paper beads are all elongated, stringing the 59 counted beads a Catholic rosary requires would have given me an extremely long set of prayer beads. So I chose to go with the Anglican rosary’s 33 counted beads so the final set of prayer beads would be more manageable. Then I just threaded a needle, strung the beads in the pattern of the Anglican rosary. I put one uncounted connector bead between each of the weeks beads and three uncounted connector beads between each set of weeks and the cruciform beads. Then I tied a surgeon’s knot (Bead One, Pray Too, page 125) and ran the thread tails back up through the beads. What do you think? 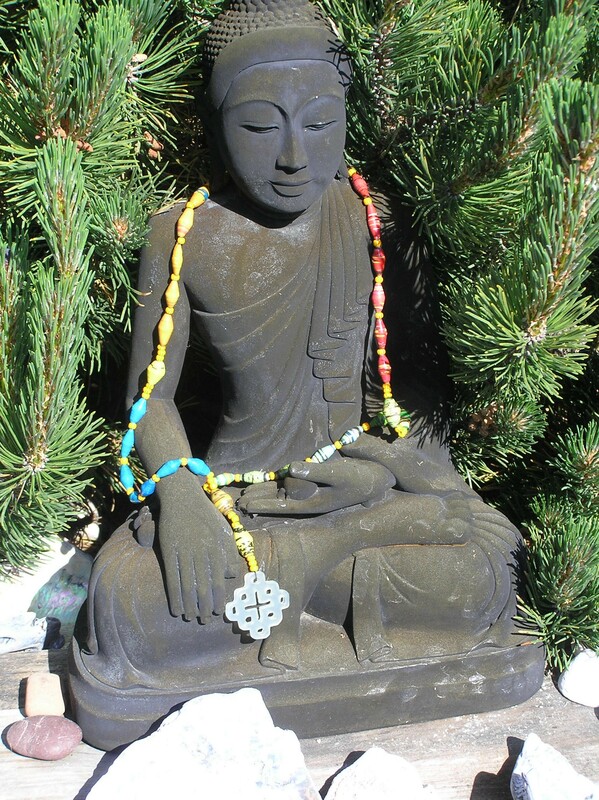 Here is a picture of my new prayer beads draped on a Buddha statue that sits in the garden of the house we rented. I love it. I love the colors and the feel of the beads – both light and heavy at the same time. 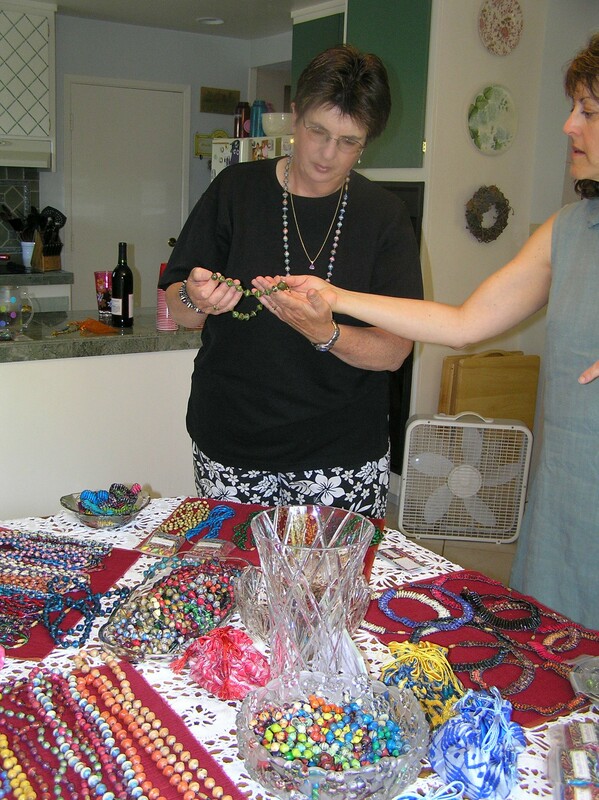 I cannot wait to have my Bead for Life party and hope I can encourage my guests to try their hands at making a set, too.